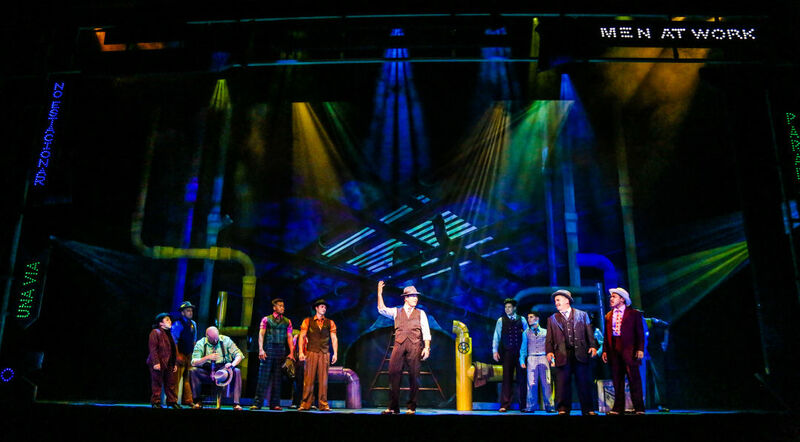 A guy-heavy scene from the TUTS production featuring both guys and dolls. Take a New York neighborhood with rampant gambling, a racy nightclub, and lots of romantic intrigue, and before you know it someone will want to swoop in and clean up the joint. What could be more American than that? 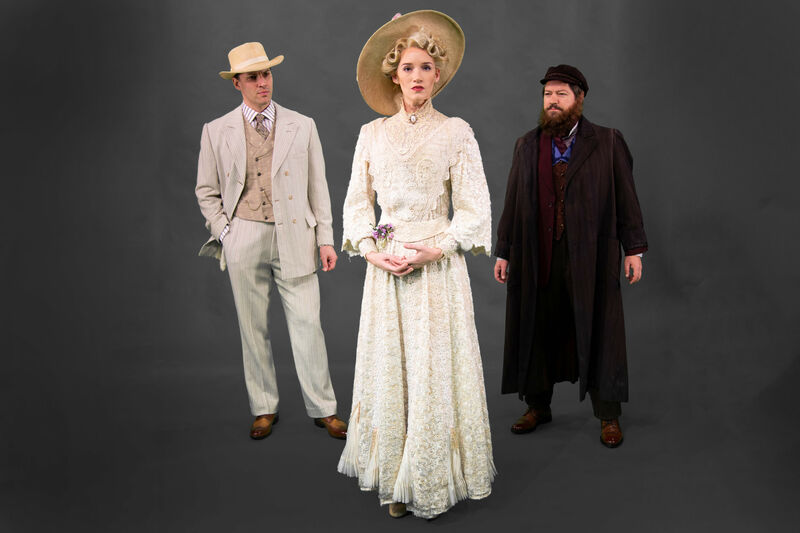 Welcome to the world of Guys (sometimes shady guys) and Dolls (some more liberated than others) and add a Latin infusion of characters, and you have Theatre Under the Stars’ new production of a classic musical. 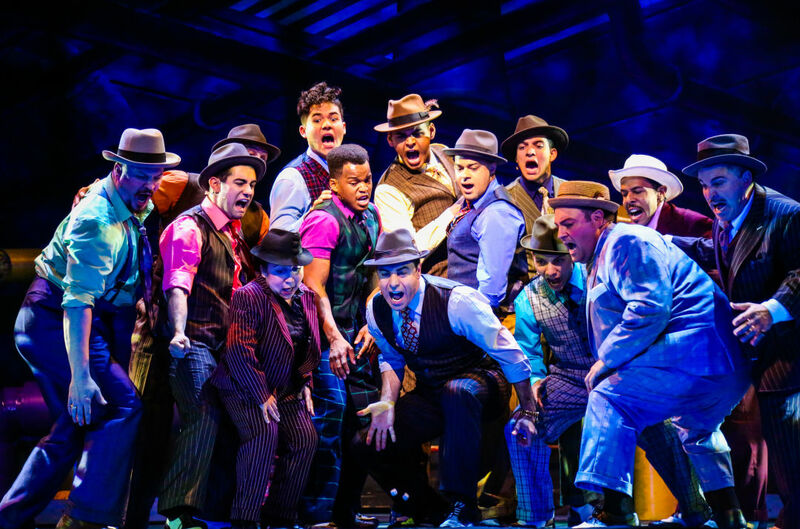 I was looking forward to seeing Guys & Dolls—I felt like the only person who had not seen this famous American musical. But even if you have not seen the musical, you might know some of the songs—like “A Bushel and Peck”—and I had listened many times to Barbra Streisand sing “Luck Be a Lady” on her Broadway album years ago. I had no idea where that song was from at the time, but it sure was catchy. So I knew I was in for some great music and lyrics by Frank Loesser. 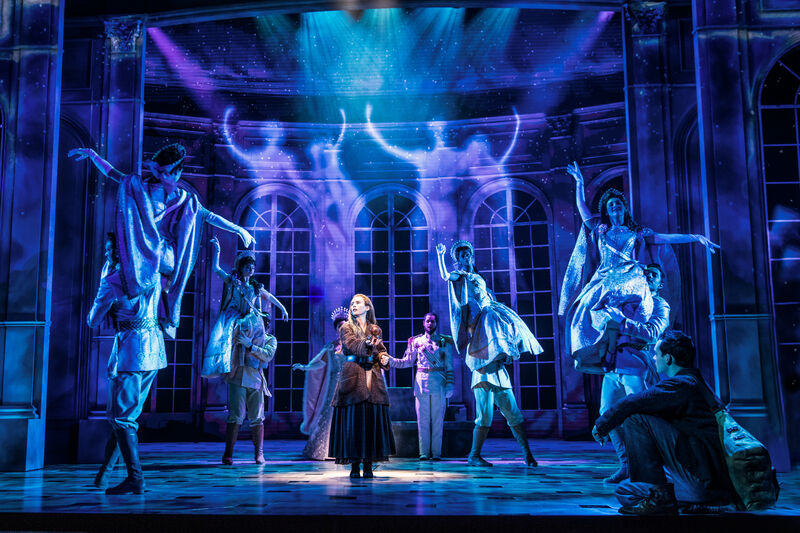 And I’ll just say right off the bat that the music and singing and dancing is all superlative in this production, which differs from some other productions with Latin inspired dances and accents. I didn’t find this particularly revolutionary, and I also wasn’t sure why it was done. I mean, did this make the show better or more interesting? Did the book by Abe Burrows and Jo Swerling need revamping based on ethnicity? Not sure. It seems to be a really dated story that uses stereotypes as comic fodder—and either you think this is funny, or you don’t. I would consider this casting a good move since the performers are so good, but I am not sure what the payoff is in the long run. This story is more about the tensions between the sexes and not really about racial or ethnic identity, and I had some trouble understanding some of the lines since the accents were laid on so thickly—often so much so I would miss a punch line that maybe was funny, maybe not. 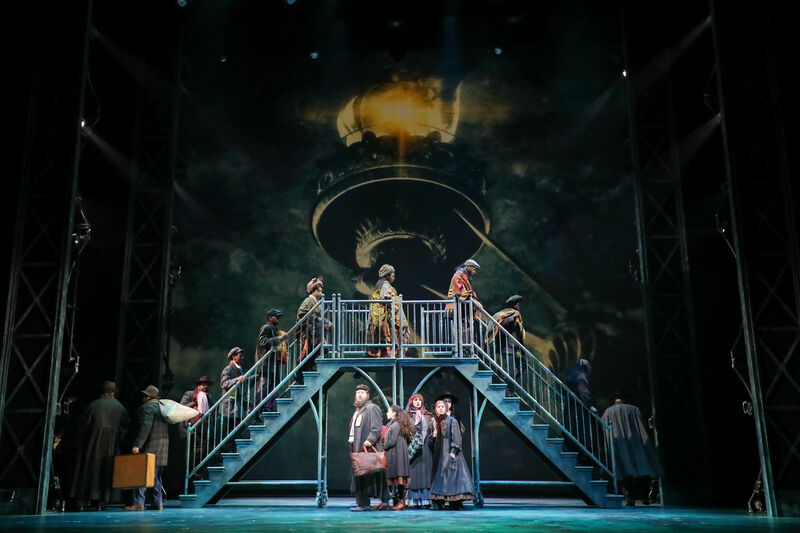 Directed by Nick DeGruccio, this musical has great singing and Musical Director Stephen W. Jones infuses verve and energy into what could have been a predictable show, especially to those who have seen it before. But the singers really deliver with Madison Claire Parks playing Sarah Brown, the Salvation Army evangelist who hopes to get the devil out of the neighborhood. (Although her singing style is highly operatic, and makes her part seem like something from the ‘40s or ’50s, in contrast to the more contemporary and modern styles of the other leads.) In any case, she has formidable pipes, and she really impressed me even when playing her uptight character when she unwinds a bit in Cuba, thanks to some local rum. She’s a pleasure to watch on the stage. Although this is a stellar cast, my absolute favorite performer was Omar Lopez-Cepero, who plays the dashing gambler Sky Masterson, and I really felt like I was in New York watching a top drawer Broadway production. He has a lot of charisma and great chemistry with the other performers, and I loved him singing “I’ve Never Been in Love Before” and “Luck be a Lady.” His performance is worth the price of the ticket. 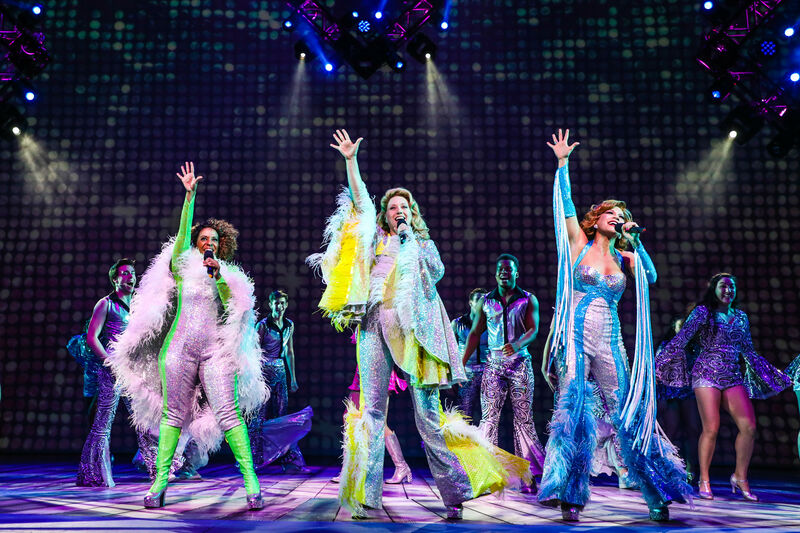 For me, it is all about the songs and the dancing, and while there are some funny lines that are well delivered, the script pales in comparison to the songs and those great dance numbers. The other storyline of Miss Adelaide (Michelle Aravena) and Nathan Detroit (Carlos Lopez) being engaged for 14 years was kind of comic at first, but it wore thin as the almost three-hour production loped along. But as bored as I was with the premises of Guys & Dolls, I could watch the scenes from Cuba and the dance numbers in Havana over and over again, and this is one show where the orchestra, the dancing, and the great costume design of Colleen Grady all comes together in an exciting and entertaining way. That alone is cause to celebrate this revival. Thru June 24. Tickets from $30. Hobby Center for the Performing Arts, 800 Bagby St. 713-315-2525. More info and tickets at tuts.com.